Facebook Watch is opening London’s first National Paw-trait Gallery in Shoreditch, designed especially for our four-legged-friends, with portraits hung at both human and dog eye level, commemorating famous, inspirational and talented dogs from around the globe – a cultural day-out for man’s best friend. The exhibition, which marks the launch of Facebook Watch’s bid to find the ‘World’s Most Amazing Dog’, is free and open to the public and their pooches from 7th – 9th February at Protein Gallery in Shoreditch. Donning the walls of the gallery will be photography of iconic dogs past and present, featuring the likes of ‘Laika’, the first dog sent into space, ‘Lassie’, Blue Peter’s original dog ‘Petra’ and Queen Elizabeth II’s Corgis. Joining them in the hall of fame will be inspiring portraits of some of the nation’s dogs with disabilities, as well as snaps of doggie influencers racking-up followers on social media. “World’s Most Amazing Dog” on Facebook Watch is a new interactive global competition series that celebrates entertaining dogs and their owners. UK Facebook users can submit an “audition” video of their pet, and then it’s up to the Facebook community to vote and decide who will win $100,000 (USD) and the title of World’s Most Amazing Dog. Auditions are open through the show page on mobile devices until 20th February, with the top dogs then reaching a semi-final, judged by celebrities George Lopez and Lisa Vanderpump, in a VOD format hosted by Preacher Lawson. 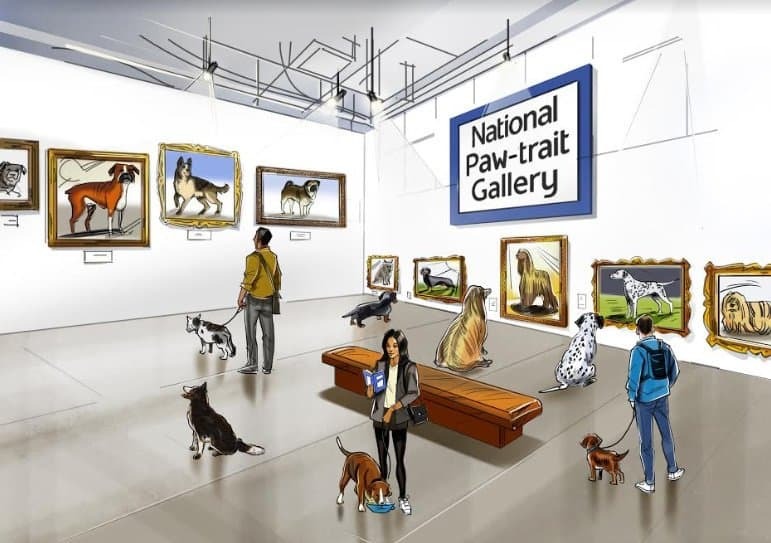 The National Paw-trait Gallery will also have an interactive space where owners can capture videos of their amazing dogs and submit their entry into the competition. For every submission made in the UK, Facebook will donate $1 to Battersea Dogs and Cats Home. Facebook Watch’s National Paw-trait Gallery will be at Protein Gallery in Shoreditch from 7th – 9th February, opening hours are 11am – 5pm. Admission is free. For more information on ‘World’s Most Amazing Dog’ and view the latest submissions, visit the World’s Most Amazing Dog page. Why not make a dog-friendly day of it and take in the dog-friendly Shoreditch Street Art + Dogs Photo Walk or check out some dog-friendly places nearby. Event description courtesy of Made in Shoreditch.